Single-stemmed or low-branched tree with a broad-oval to rounded crown. 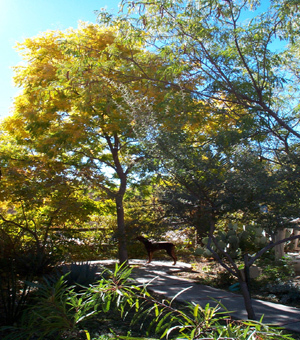 Leaves are medium green turning a deep golden yellow in autumn. The leaves are alternate, compound, and even pinnate, 8 to 18 leaflets, each short stalked, obliquely lanceolate, 1 1/2" to 3 1/2" long, 1/2" to 1" wide, each leaflet slightly curved or sickle-shaped. Bark is shallowly furrowed and develops a patchwork of gray-brown to reddish brown. The tree has a medium growth rate. The fruit is a translucent amber globe containing a hard seed.